To better view this blog go to http://www.joethecouponguy.com/blog1. NEW this year! The 2014 Entertainment Book is valid now through December 30, 2014 instead of Nov 1! Get 25% OFF your stay at Wyndham when you book at least 7 days in advance. Plus get 500 Wyndham Rewards bonus points! Save 20% Off When You Stay 3 or More Nights at Ramada! 20% OFF 3 nights at Howard Johnson! 20% OFF 3 nights at Travelodge! Stay 2 nights and SAVE 15% at Travelodge! 20% OFF 3 nights at Knights Inn! 20% OFF 3 nights at Microtel Inns & Suites! Stay 2 nights and SAVE 15% at Wingate by Wyndham! Find great deals with the Special Deal Finder! Save up to 50% with our hotel deal of the day! 48 Hours to save 30-50% in great cities! Hurry these deals won’t last long! $25 for a Single-Day Admission to the 20th Annual Vintage Ohio Wine Festival in Kirtland on August 1 or 2 ($35 Value). LivingSocial’s birthday sale is going on now! In celebration of LivingSocial’s first deal launching 5 years ago, they’re running a sale all weekend long. Save 20% off your next purchase when you use code LSBDAY through Sunday, 7/27. 1.Take 20% off your next purchase for almost any deal on LivingSocial when you use promo code “LSBDAY”. 2.Add Deal by clicking “Buy Now” button on the Deal information page. 3.Click on “Redeem promo code” during purchase process. 4.Enter code “LSBDAY” and hit apply. You may only use this code once. 5.The amount of the savings will be reflected on the final purchase confirmation page. *Maximum savings of $20 USD on purchases made in USD Dollars, $20 CAD on purchases made in CAD Dollars. Promo code must be used between July 24, 2014 12:00 a.m. (Eastern Time) and July 27, 2014, 11:59 p.m. (Pacific Time) Promo codes may only be used on new purchases and cannot be applied to previous purchases. Promotion requires a LivingSocial account, and is subject to terms and conditions found at here. Entire amount must be used in one transaction; no partial redemptions; may not be combined with any other offer. Promo codes not valid for ticket or Deal purchases required to be completed on a third party site. LivingSocial reserves the right to cancel the promotion at any time. This offer is single-use and non-transferrable. If you return your purchase, you will be refunded the amount paid. Offer good while supplies last. Void where prohibited. Valid in the US and Canada only. Rail Europe combines the maps, schedules and fares for over 50 different train companies across Europe, creating one stop to plan and book your European rail travel. Save 10% On Stock Items During their Back To School Sale At DiscountSchoolSupply! Use Code: BTS14 At Checkout! Shop Clearance Blow Outs and save up to 68% off retail! Going to college? This site could save you hundreds of dollars on your textbooks! Why buy a college textbook when you can rent it rather than buying one and selling it for pennies on the dollar. Instead try Bookrenter where you can rent textbooks and ship them back for free. BookRenter is the original online textbook rental service. They offer one-stop shopping with the largest selection of high quality college textbooks at unbeatable prices. Students save up to 80% and never pay for shipping by renting their college textbooks through BookRenter. Student Advantage® is the nation’s most widely-accepted student discount card for students and parents. No matter where your visitors are located, they will be able to save with Student Advantage because they’ve partnered with thousands of regional, national, and online merchants to give customers up to 50% savings on pizza and textbooks to online stores and everything in between! Click here to save $10 on your Student Advantage card! Up to 80% of entering college students have no clear idea of a major. Studies have found that a college student changes their major 4 times while in college. This indecisiveness can lead to an extra fifth year of college or even longer, costing extra in classes not necessary for the major. Before deciding on a major, shadow someone that has the type of career you want to see if you really want to be in that field. A web-site, http://www.MyMajors.com, helps students decide on educational goals by selecting five majors through a series of questions. A study by the American Enterprise Institute found that only 53.7% of first-time, full-time students enrolled in fall 2001 graduated from the same institution by 2007. Only 57% if first-time full-time college students complete a bachelor’s degree within 6 years. I’m sure a lot has to do with trying to pay for college while working. It’s not easy to do both. Having some savings before you enter college sure makes things easier. The trouble is that some teens find it too easy to spend and not save when they’re young. It takes a lot of discipline and a lot of Lemonade stand sales. Parents are having a hard time to come up with the money to help pay for college for their kids, let alone their own retirement. A college education is a piece of paper that will help differentiate yourself from others in this job market as there are around 28% of the adult population with Bachelors degrees or higher. One way to help pay for college is to get a scholarship. There are many scholarships out there, but you may not be able to easily find them. Get started now so that you are first in line for scholarships. Sometimes nobody even applies to get scholarships from certain organizations – so give it a try! These sites make it easy. Find available scholarships at http://www.collegescholarships.org, http://www.fastaid.com, http://www.fastweb.com, http://www.govbenefits.gov, http://www.scholarshipexperts.com, and http://www.supercollege.com. Look for additional scholarships through any organization you are affiliated with including ethnic groups, local community groups like the Rotary International or Eagles, religious group, and via a parent’s employer. For more scholarship info go to http://www.collegeanswer.com, http://www.scholarships.com, or http://www.collegeboard.com. Check out http://www.finaid.org and http://www.savingforcollege.com for financial aid tips, college cost calculators, and other help. Check http://tinyurl.com/Edmunds2014 or http://www.carsdirect.com/research/incentives_search to find out what rebates are being offered to students for car purchases. I was able to get a $1,000 rebate when I bought my first car within 6 months of graduating. Many car manufacturers offers rebates for students, mostly once you graduate. A 529 college plan account is a federal tax benefit that allows money to be withdrawn from the account tax free as long as it is used for tuition and books for college. It can also be used as a state tax deduction in Maine, Pennsylvania, and Kansas. http://www.Upromise.com – rewards dollars for 529 college savings plan on purchases through affiliated stores using debit or credit card purchases, Upromise restaurant partners, or visiting on-line retailers. Earn rewards with coupons and deals on the site. http://www.Babymint.com – Merchant contributions generally range between 1 – 26% of your total purchase and are automatically deposited into your educational investment account or into another payment plan of your choice. Teachers can find many discounts just for teachers at various businesses listed at: http://www.bradsdeals.com/blog/teacher-discounts/. Stores like OfficeMax offers special discounts and rewards for teachers. Budget for college. Not including room and board, the cost in 2011-2012 for a state public four-year college cost $8,244 annually, according to data from the College Board Advocacy and Policy Center. A 2 year public college cost $2,963 annually. The average published tuition (no room and board) for 2012/2013 was $29,056 for a private four-year college and $8,655 for a public four-year college. The average cost increase continues to exceed inflation. Find out the net cost of college at http://www.collegedata.com/cs/promo/promo_netcost_tmpl.jhtml. The U.S Census Bureau data from 2007 found that adults with less than a high school education earned, on average, four times less than those with a master’s degree. The report is found at http://www.census.gov/population/www/socdemo/educ-attn.html. JC Penney’s salon is offering kids haircuts for $10. 10) Kept dissecting frogs at summer camp. 9) Every time a magazine was delivered by mail to your home you kept putting a book cover on it. 8) You start dry heaving at night because you thought you had a test the next day. 7) After watching the lottery show you reminisce about the combination of your lock from the prior year. 6) You miss the smell of the teacher’s perfume or cologne. 5) The welt from getting hit in the head during dodgeball in gym has healed. 4) You forget how horrible the lunch food was and now crave it again. 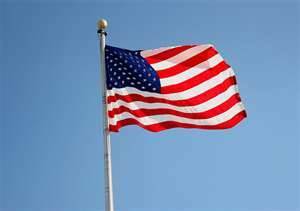 3) You say the “Pledge of Allegiance” when you wake up in the morning. 2) You miss being tardy. 1) You can’t wait to show off your new wardrobe that was handed down from you from your older sibling. Did you see the story about the gal who got berated for not telling the waitress that she was using a Groupon before she ordered? Not only that, she couldn’t redeem the Groupon because she didn’t say she was using it before her meal was ordered. But the nasty thing was that the lady who berated her, the wife of the owner, made snide comments about the oxygen tank the gal was using…and she was using it because she only has months to live and she needed to use the coupon because her income was limited. Yet, she paid in full and didn’t use the Groupon because of the restaurant’s rules. The poor gal was shaken up and didn’t deserve the treatment she got. She even apologized rather than the owner’s wife apologizing! Word is this type of behavior wasn’t the first time it’s happened. Hosts or anyone working with people need to be gracious and she wasn’t. Sure, there were signs all over the place stating to mention using the Groupon, but why is it necessary to state you are using a coupon? Why don’t they make it more customer friendly by having the waiter or waitress ask the customer every time if a coupon was being used before they order. It saves the embarrassment and anger that might ensue from happening. I’ve been to the restaurant only once before. The restaurant is Mama Robertos in Mentor. I did use a Groupon there. I remember seeing the signs and though to myself that I was glad I didn’t forget to mention it. If I was busy or distracted I could see not noticing the signs. I’m sure parents with young kids would miss seeing it because they are paying attention to their kids. So after enough times of not seeing the sign I’m sure this lady got all bent out of shape more and more each time someone didn’t mention the coupon as the rule stated and she would just boil over every time. I found it unusual that they were so militant about needing to mention the coupon before the meal. Why? Do they skimp on your meal portion if you use it? Apparently, they may feel it takes more time for the waitress or waiter to ring up the order after they get a coupon. That’s ridiculous. This is how it works. Get check. Give coupon with credit card and check. Nothing there adds any extra time. If the patron forgot to include the coupon with the check, then I could see it taking an extra step if they forgot to give the coupon with the check, but that is where the waitress or waiter can always ask if they have one. I usually always mention any coupon I plan to use before I order to make sure they are still taking it. I don’t want to find out after the fact that they are not taking it for whatever reason. There is a chance I will up and leave if they don’t. It’s obvious this lady was stubborn to the point she couldn’t see that her “coupon signs” were not working. She stuck to her guns and now is paying a hefty price because of all the negative criticism. Sure, she can make her own rules, but when your rules piss off the customer it’s time to reassess. There are tons of restaurants to go to and it takes only once for a customer not to go to a restaurant anymore because of a bad experience. Restaurants come and go for that very reason. I’m sure they have loyal patrons and folks love their food and they’ve been good to people in the past, but if only takes once to get in trouble. I haven’t heard the owner’s wife apologize. I know people in life that always think they are right and have a hard time being humble and apologize when they do wrong. Groupon even offered $150 to the gal with cancer. She should work away from the public if she has a short fuse. We all have bad days, but I’m sure it wasn’t the first time something like this happened with her. So was the rule really worth alienating customers? If they frown upon people using coupons, then don’t offer them! I get really irked when people get snotty about people who use coupons. What if that person was using coupons because they could barely make ends meet just like this couple? People should appreciate someone trying to save money instead of wasting it. As the saying goes, do others as you would have them do to you. Get a FREE DNA kit with a 6-month subscription, a $99 value! Find out about your relatives with Ancestry! Learn how to save a ton of money at one of my classes! Learn how to save 70% and more grocery and toiletry shopping. Find out how to save money on restaurants, utility bills, cell phones, travel, gas, prescriptions, and on much more! To view my upcoming class schedule please go to: http://www.joethecouponguy.com/schedule/index.htm . Be sure to register for libraries that require registration as some have waiting lists. All classes are free unless otherwise noted. I hope to see you there! If you’re interested in booking a class for your organization whether it be a PTA, Senior Center, Business, Church, or Library, please contact me at joe@joethecouponguy.com or 440-227-6223. I’ve done classes all across Ohio and for many businesses including the Cleveland Clinic, Bendix, Lake Hospitals, Hyland Software, and others. I can tailor the topics to your organization. If you’d like for me to teach a class at your local library, feel free to contact your library and request me. Have them get a hold of me at joe@joethecouponguy.com to book me. 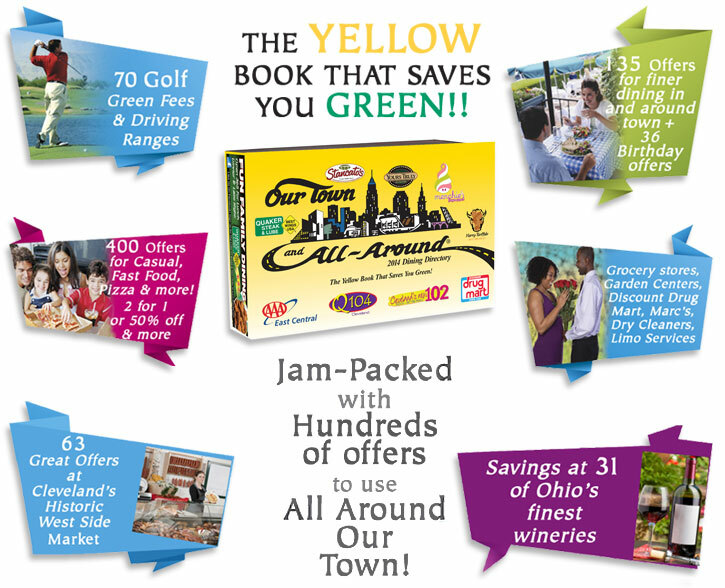 The 2014 Our Town coupon book is on sale now for $20 with FREE shipping! Get it now so that you can use the coupons from now until Dec. 1, 2014! A bargain for around 1,000 coupons! Very limited supply available. 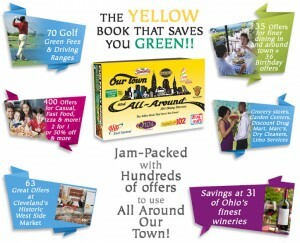 The Our Town coupon book has around 1,000 coupons for Northeast Ohio area restaurants, fast food, drug stores, movies, golf courses, pizza, dry cleaning, wineries, entertainment and more! The Best coupon book available in the area! It’s like getting 1,000 Groupons, but all for only $28! Some restaurant coupons are good for up to $32 off! The book can pay for itself with just one coupon! * RESTAURANTS – Restaurant coupons include the Wood & Wine, Stubby’s, Dervish Grill, Plaza Agave, Oriole Cafe, Peppermill Pub & Grill, Hooley House, Cabanas, Barley House, Chocolate Martini Bar, West Park Station, Your Truly, Harry Buffalo, Shula’s, Melting Pot, Scrambler Marie’s, Quaker Steak & Lube, Frankie’s Italian Cuisine, Stancato’s, Tavern of Richfield, Joey’s, Bongiorno’s, Mahle’s, Dino’s Willoughby Brewing, and over 120 more! * FINE DINING – 136 Fine Dining Restaurants with savings of $10 or more. Most offer half off dinners for those dining alone! Some are valued up to $30 off! * ENTERTAINMENT – Coupons for museums, tickets for local attractions, sport-related attractions, comedy clubs, and much more! * LITTLE ITALY – this year is our “On the Hill”, a section of Little Italy restaurants such as La Dolce Vita, Maxi’s, Trattoria, Il Baccio, Guarino’s, and Primo Vino. * WEST SIDE MARKET – 63 offers for businesses at the iconic West Side Market. * BIRTHDAY COUPONS – FREE dinners on your birthday coupons. * FAST FOOD/PIZZA/LOCAL RESTAURANTS – Over 400 “two for one” or “50% off” offers at fast food restaurants, pizza restaurants, and neighborhood favorites. Find coupons for Qdoba, Buffalo Wild Wings, IHOP, Amy Joy, Burger King, Menchie’s, Mr Hero, Taco Bell, Wendy’s, Kentucky Fried Chicken and tons more! * WINERIES – 31 coupons for wineries from across Northern Ohio including Ferrante, Paper Moon, M Cellars, and Debonne. * GOLF – Coupons for 70 green fees & driving ranges. * MISC. COUPONS – Coupons for dry cleaning, tanning, IGA (five $5 off $20 purchase coupons), Bremecs, Gale’s Garden Centers, GFS, and much more! Get a $25 gift card at Discount Drug Mart or $15 gift card at Marc’s with the transferred prescription coupon in the book (have them honored as competitors coupons at pharmacies at Giant Eagle and others). * ALL 2014 Our Town coupons good now through December 1, 2014! Get the Savvy Shopper Booklet and learn how to save tons of money on dozens of different topics. The booklet with over 180 pages was updated in 2013 with thousands of money-saving tips. Great for someone just starting out or wants to learn more ways to save money. Only $13 (includes FREE shipping)! You could learn to save thousands and thousands for just the cost of a large pizza! Get wipers, windershield washer fluid and other car needs at a discount at Advance Autoparts. Take $50 off orders over $100 for the first 1000 customers, $40 off $100 for next 1000 customers, and 30% off nearly everything for next 2000 customers with code WD30 at AdvanceAutoParts! Save 15% on all orders AAP15OFF 7/1 7/31 Save 15% On Your AdvanceAutoParts purchase with code AAP15OFF until 7/31. Valid online only. Take $10 off $30, $25 off $70 and $40 off $110 orders with code A124 at AdvanceAutoParts! Ends 7/31. Valid online only. Scan you CVS loyalty card before you shop at the CVS coupon kiosk inside stores near the entrance to get coupons. Additional 40% on select items and 30% off on others clearance starts 7/24/14. Get saving over 75%! Click here for coupons like $5 off $25 at Dollar General: http://www2.dollargeneral.com/Ads-and-Promos/Coupons/pages/Index.aspx? Giant Eagle doubles coupons that are 99 cents or less. That means a .75 coupon will double to $1.50 off. It happens automatically when a coupon that is 99 cents or less is scanned at the register – 7 days a week, 24 hours a day. Get 10 cents in Fuelperks for every $50 spent ($3 savings). Look for new deals each day this week with items at 70% off. Find great clothing and accessories deals for the youth of America at Justice Brothers. $5.99 Flat Rate Shipping! Valid 7/11-8/4. Justice School Uniforms in 75+ School-Approved Styles – Online Only! Brothers Introduces New School Uniforms: Polos, Shorts & Pants – Online Only! Online One Day Only! Buy One, Get One Free! Valid 7/27. Online One Day Only! Extra 20% Off Backpacks! Valid 7/28. Online One Day Only! Buy More, Save More on School Uniforms! Valid 7/29. Online One Day Only! Extra 30% Off Clearance! Valid 7/30. 5 Day Sale! Take 40% Off Entire Order + 20% Off Every Item! Valid 7/31-8/4. Thru 8/18 – Get $30 In Rewards For Every $50 You Spend at Justice & Brothers! Look for $25 gift card coupon with a transferred prescription in their ad. Get 30 cents off per gallon of gas when Shop Your Way Rewards members buy $50 or more in specialty gift cards. FREE $20 OfficeMax® Gift Card when you buy 2 HP toner cartridges. Gift Card good toward next purchase. Limit 1 offer. FREE USB Drive when you purchase $59 in HP ink at OfficeMax. Limit 2 offers. Take 30% off your purchase at Old Navy! Use code BIGTIME. Ends 7/29. Restrictions Apply. Save 25% off Regular-price items + 15% off Sale merchandise at Old Navy! Use code ONSAVENOW. Premium Outlets (Aurora Farms, etc) are having a Back-to-School & Fall Preview Sale from Thu – Mon, Jul 31 – Aug 4. Enjoy extra savings on top of everyday savings of 25% to 65%. Get multiple deals! Many of the deals have a limit offer of 2 and sometimes more. Check the circular or price tag at the store to find out the limit offer number. Look for $25 UP reward coupon with a transferred prescription in their ad – UP rewards expires in 2 weeks. Earn one point for every dollar you spend on non-prescriptions. Earn 25 points for every prescription you purchase. Load, manage and redeem coupons and +UP Rewards with Load2Card. Register Rewards on qualifying purchases. 24/7 exclusive access to a pharmacist at 1-800-RITE-AID or http://www.riteaid.com/wellness. 10% off Rite Aid Brand every day for a year and a 10% off shopping pass with Bronze status. 10% off the entire store for a year with Silver status. Free health and wellness reward at 500 points with Silver status. 20% off the entire store for a year with Gold status. Get the Rite Aid Video Values coupons at http://riteaid.adperk.com/. Watch short videos and get coupons! Take an extra 50% off clearance curling & flat irons at SallyBeauty.com! No promo code is needed to take advantage of this great deal. Hurry, offer ends 7/27 at 11:59 pm EST. Get a free bag with your $15+ purchase at SallyBeauty! Enter promo code 555142. Shop the Salon and Spa Equipment BOGO through 7/21 at SallyBeauty! Receive Free Ground Shipping with purchase of Revlon Ready-to-Wear Fabulength 18″ Extensions at SallyBeauty! Enter code 555141. Valid through 7/31. Friends and Family: Save an additional 10% on all Sears Outlet goods! Save 42% (Reg. Price $349.99) On thermos 4-Burner Gas Grill with Side Burner at Sears Outlet! Save 32% (Reg. Price $499.99) On Char-Broil 6-Burner Gas Grill at Sears Outlet! Save 37% (Reg. Price $159.99) On Char-Broil 2 Burner Gas Grill at Sears Outlet! Save 50% (Reg. Price $399.99) On Irvington 5pc Cushion Dining Set at Sears Outlet! Save 44% (Reg. Price $499.99) On Fairfield 7pc Cushion Dining Set at Sears Outlet! Save 48% (Reg. Price $2499.99) On 26.7 cf French Door Stainless Steel Bottom Freezer Refrigerator at Sears Outlet! Save 25% (Reg. Price $539.99) On Kenmore Electric Dryer at Sears Outlet! Located next to Gale’s Garden Center in Willoughby Hills. Back this Weekend! THURS-FRI-SAT-SUN Only! ORGANIC SWEET CHERRIES $ 1.49 lb!!! WOW! Fresh Blueberries .99 per pint! Extra Large Pineapple .99 each!!! Look for $5 off $20 meat purchase coupon in ad. Join Balance Rewards to earn points on thousands of items, including every prescription and immunization. Purchase items in-store or online to earn points. Redeem points for dollar rewards that you can get instantly at the checkout. Get coupons just like the ones in the Red Plum inserts. Get these coupons and over 200 more on Coupons.com. Most all stores take internet coupons. They will double at stores as per their rules – Giant Eagle, Dave’s Supermarket, and Buehlers doubles coupons of 99 cents and less. Get them before they disappear! Get ecoupons and more on Saving Star. Just enter in your loyalty card accounts then click on the coupons you want and you’ll get the savings once the item is purchase (can still use manufacturer or store coupon on item). Accumulate the savings and then send it to your PayPal account or other account. Every Friday is Freebie Friday. Get an item for free once you activate the item online and purchase it at a linked loyalty card store. Get a 1 year subscription for just $19.92, only $1.66 an issue plus receive a free summer tote and our grilling guide full of tasty recipes! Plus, with tons of coupons and tips, this magazine pays for itself! Be sure to take advantage of this great offer now! Hurry, offer ends 8/31. Find great money saving coupons, spring cleaning tips & shortcuts, family menus & recipes, free samples, and a whole lot more! Find these limited time deals below and tons of other magazine subscription deals on their site. Take an Additional 25% Off EVERY Magazine in our $4.69 and $5.95 Category. Use Coupon Code 25OFF During Checkout. Magazines start as low as $3.52 with coupon! Order Multiple Years & Save Even More! Weight Watchers Magazine Just $3.99 for 1 Year at Best Deal Magazines, July 28th Only – Use Coupon Code 15CJ0810 and Save an Additional 15%! Woodcraft Magazine Just $6.49 for 1 Year at Best Deal Magazines, July 29th Only – Use Coupon Code 15CJ0810 and Save an Additional 15%! Plane & Pilot Magazine Just $3.89 for 1 Year at Best Deal Magazines, July 30th Only – Use Coupon Code 15CJ0810 and Save an Additional 15%! Life Extension Magazine Just $3.99 for 1 Year at Best Deal Magazines, July 31st Only – Use Coupon Code 15CJ0810 and Save an Additional 15%! Young Rider Magazine Just $6.49 for 1 Year at Best Deal Magazines, August 1st Only – Use Coupon Code 15CJ0810 and Save an Additional 15%! Boys’ Life Magazine Just $4.99 for 1 Year at Best Deal Magazines, August 2nd Only – Use Coupon Code 15CJ0810 and Save an Additional 15%! Nylon Magazine Just $3.29 for 1 Year at Best Deal Magazines, August 3rd Only – Use Coupon Code 15CJ0810 and Save an Additional 15%! Cabela’s Outfitter Journal Magazine Just $3.99 for 1 Year at Best Deal Magazines, August 4th Only – Use Coupon Code 15CJ0810 and Save an Additional 15%! Outdoor Photographer Magazine Just $3.29 for 1 Year at Best Deal Magazines, August 5th Only – Use Coupon Code 15CJ0810 and Save an Additional 15%! Phineas & Ferb Magazine Just $14.99 for 1 Year at Best Deal Magazines, August 6th Only – Use Coupon Code 15CJ0810 and Save an Additional 15%! Shape Magazine Just $3.29 for 1 Year at Best Deal Magazines, August 7th Only – Use Coupon Code 15CJ0810 and Save an Additional 15%! Natural Health Magazine Just $3.29 for 1 Year at Best Deal Magazines, August 8th Only – Use Coupon Code 15CJ0810 and Save an Additional 15%! Thomas & Friends Magazine Just $14.49 for 1 Year at Best Deal Magazines, August 9th Only – Use Coupon Code 15CJ0810 and Save an Additional 15%! Family Fun Magazine Just $3.29 for 1 Year at Best Deal Magazines, August 10th Only – Use Coupon Code 15CJ0810 and Save an Additional 15%! Take An Additional 15% Off at Best Deal Magazines. Enter Coupon Code 15CJ0810 During Checkout. Offer expires August 10, 2014. 60+ Popular Magazines – Just $3.99 with this coupon! 30+ Popular Magazines – Just $5.24 with this coupon! Take an Extra $5 off $30 at Best Deal Magazines. Enter Coupon Code SAVE5CJ0810 During Checkout. Offer expires August 10, 2014. Take an Extra $7.50 off $40 at Best Deal Magazines. Enter Coupon Code SAVE750CJ0810 During Checkout. Offer expires August 10, 2014. Take an Extra $10 off $50 at Best Deal Magazines. Enter Coupon Code SAVE10CJ0810 During Checkout. Offer expires August 10, 2014. Take an Extra $15 off $70 at Best Deal Magazines. Enter Coupon Code SAVE15CJ0810 During Checkout. Offer expires August 10, 2014. Sat, July 26th and Sun, July 27th. It’s the Multi-Year Sale! Subscribe to more years of your favorite magazines and enjoy a greater savings at DiscountMags.com! Get these deals and more for annual subscriptions. Use code JOETHECOUPONGUY to get an additional 20% off on selected magazines! Amazing Magazine Subscriptions with No Auto Renewals, No Sales Tax, and Free Shipping on Any Order (No Minimum) at DiscountMags! Find deals in your town and thousands of deals across the U.S. on Deal Chicken. Click on ‘Offering a Deal’ under Features to find discounted local business deals on Yelp. Find hundreds of deals up to 90% off on Eversave. African Safari Wildlife Park for $8! Visitors in cars can offer food to freely roaming African species such as bison, elk, zebra, giraffes, and camels in Sandusky. THIS WEEKEND ONLY July 24th- July 27th, users can communicate with their matches absolutely FREE! This promotion is US only! Get $25 restaurant gift cetificates for $10 and less with bonus codes! Find certificates for these restaurants and tons more: Johnny’s on Fulton, Il Bacio, Bodega, Carrie Cerino’s, Alfonsos, Becky’s Bistro, Divot’s, White Oaks, Bier Hais, Paws, The Cabin at Mario’s, Amber Oaks, Sweet Pea Cafe, CKs Steakhouse. Get $3 off at Red Robin from Mon-Thurs, 7/28-7/31 when you bring in your Hercules movie ticket. Listen at 7:18 AM on Wednesdays to WINT 1330 AM as I go over the deals of the week on the Wake Up Lake County Show. Go to http://www.WELW.com to listen to old podcasts or to listen live. 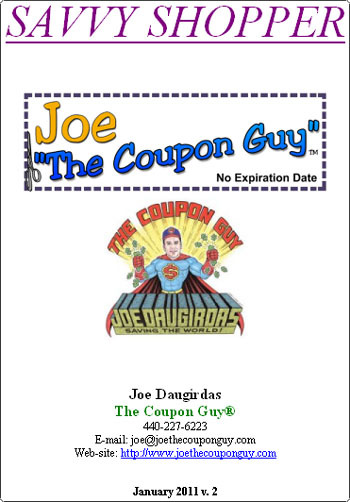 You can Like The Coupon Guy on Facebook at http://www.facebook.com/pages/Joe-The-Coupon-Guy/197073886914. Sign up for my e-mail savings newsletter at http://www.joethecouponguy.com/mailinglist/index.htm. Disclosure: This blog accepts forms of compensation. The compensation received may influence the advertising content, topics or posts made in this blog. ENTERTAINMENT BOOKS 2 FOR $10 PLUS FREE SHIPPING! LAST CHANCE! 2 Books for $10 + Free Shipping – Last Chance! (Valid 7/21/14-7/27/14). Get one for your city and one where you’ll be travelling! To better view this page got to http://www.joethecouponguy.com/blog1. Get 20% off your AutoTrader car listing. Sell your car or motorcycle using Autotrader! Find some great deals for them too! Yes, find $39 glasses and less with these deals! Save $15 off every pair of eyeglasses and sunglasses on your order! Use code EAGLE15. Expires 07/31/14. Check your MyGroupons page to see if you have any credits issued for unused Groupons. I had some listed even though I could’ve sworn I used them. There are times where the business doesn’t register using the Groupon so it ends up showing up unused after the expiration date. The credit available is the amount paid for the Groupon (not the amount the Groupon was worth originally). In other words, if you paid $25 for a $50 Groupon and it expired, it is worth $25 and not $50. Buying from local farms may cost less than purchasing produce at a grocery store. Can’t get any fresher and it supports the local economy. Find local farmers market sellers at http://www.localharvest.org/, http://www.cleveland.com/food/index.ssf/2014/06/2014_northeast_ohio_farmers_ma.html, and http://www.eatwellguide.org. Pick- your-own farms can be found at http://www.pickyourown.org. The site includes pumpkin patches and Christmas tree farms. Ok, where do I start with this story. Seriously. It’s no wonder so many of my friends are so healthy. Apparently researchers found that mitochondria, a bacteria, produced in farts helps ward off cancer! I just heard all my friends groan. Yes, the bacteria gets breathed in and it wards off cancer cells. I am shedding a tear knowing that I’ve helped so many people. So the next time I ask you to pull my finger don’t run away like usual. Pull heartily and linger around as you get bathed in air medicine. You are welcome. All Coupon Books are $5.99 each + $1 Shipping Only at Entertainment.com! (Valid 7/14/14-7/20/14). All Books $5 + Free Shipping when you join Annual Renewal! Take $5 Off Orders Over $25, $10 Off Orders Over $50, or $25 Off Orders Over $100 with code MCH41 at AdvanceAutoParts! Ends 7/30. Take 50% off on patio furniture and many summer and yard items. Get 20 cents in Fuelperks on every $50 spent on select gift cards. Cereal – assorted varieties – FREE after .75 of $1 coupons and .20 Fuelperks Reward ($6 value with 30 gallons redeemed) with the purchase of every 3 – look for coupons at http://tinyurl.com/couponguycoupons including .75 Golden Graham, .50 Cheerios. .70 Jiff, $1 Cheerios Protein, .50 Lucky Charms and others – plus get .75 Golden Grahams eOffer – plus get Saving StarSaving Star .75 Golden Graham, .75 Cheerios e-coupons at http://SavingStar.ojrq.net/c/20559/58552/758. Get eOffers and newspaper coupons too. Qualified high school and college students are eligible to receive two money-saving coupons, valid in-store and online, and a 10% discount on every purchase, every day* when you register for the Jo-Ann Student Discount Program. *Some exclusions apply. See card for details. Any student 14 or older at time of enrollment and currently enrolled in high school (Grades 9-12) or a higher learning institution, such as a college or university, qualifies for the Jo-Ann Student Discount Program. ◾Student identification card for the current school year with the college, school or school district clearly identified. ◾College acceptance letter signifying enrollment into a program. ◾A report card from the current school year if your school does not issue identification cards. Up to 75% Summer Clearance event. $20 OFF your purchase of $125+ with code: SAVE20. FREE $15 OfficeMax® Gift Card when you purchase $75 in HP ink. Gift Card good toward next purchase. Limit 1 offer. Stuff & Save – Save 30% with code STUFFSAVE when you use your Old Navy Card or save 20% with code FASHION through 7/24. $7 off orders of $70 or more at Petco online! Click here for a $5 off $30 coupon good through 7/20: http://www.petsuppliesplus.com/coupon.jsp? Get a Free Revlon Twister Extension with purchase of Revlon Ready-to-Wear Fabulength 18″ Extensions at SallyBeauty! Add both items to your cart & enter promo code 555136. 40% Off Paints & Stains July 18-21. Save 42% (Reg. Price $34.99) On Pendleton Folding Chair at Sears Outlet! Save 60% (Reg. Price $14.99) On Amazing Glove at Sears Outlet! Save 40% (Reg. Price $39.99) On Oster Baldwyn 14pc. Stainless Steel Cutlery at Sears Outlet! Up to 40% Off Ellipticals at Sears Outlet! Up to 40% off Grills at Sears Outlet! Up to 40% Off Push Mowers at Sears Outlet! Through 7/20 Only!!! ORGANIC Bing Cherries $ 1.49 lb WOW! 7 FOR $26.50 UNDIES (IN STORES ONLY. Spend $50+ Online, Get 10,000 Balance Rewards points – a $10 value! Save 20% on any single purchase of loose Lemons & Limes at participating retailers. See offer info for complete details. Check back every Tuesday for a new Healthy Offer. Expires 7/21/2014. One time use only. Get a 1 year subscription for just $12 or a 2 year subscription for $15, that’s only $0.63 an issue. This is the best multi-year offer they have ever had, take advantage of this great offer now! Hurry, offer ends 7/31. Or get 3 issues of All You for only $5 plus get a FREE Coupon Book. Every All You subscription between now and July 31st will be accompanied by a FREE coupon book with hundreds of dollars in savings – get this great offer while it lasts! This coupon book includes savings to top retailers including The GAP, Best Buy, Sears, and many more great stores. Take advantage of this great limited time offer now! Coupons, savings tips, and a FREE coupon book, what could be better? Find great money saving coupons, spring cleaning tips & shortcuts, family menus & recipes, free samples, and a whole lot more! Take an Additional 25% Off EVERY Magazine in our $4.69 and $5.95 Category. Use Coupon Code 25OFF During Checkout. Magazines start as low as $3.52 with coupon! Order Multiple Years & Save Even More! Simple & Delicious Magazine Just $8.49 for 1 Year at Best Deal Magazines, July 21st Only – Use Coupon Code 15CJ0727 and Save an Additional 15%! ShopSmart Magazine Just $14.49 for 6 Issues at Best Deal Magazines, July 22nd Only – Use Coupon Code 15CJ0727 and Save an Additional 15%! Sesame Street Magazine Just $14.49 for 1 Year at Best Deal Magazines, July 23rd Only – Use Coupon Code 15CJ0727 and Save an Additional 15%! Rider Magazine Just $3.99 for 1 Year at Best Deal Magazines, July 24th Only – Use Coupon Code 15CJ0727 and Save an Additional 15%! Parents Magazine Just $3.89 for 1 Year at Best Deal Magazines, July 25th Only – Use Coupon Code 15CJ0727 and Save an Additional 15%! Natural Health Magazine Just $3.89 for 1 Year at Best Deal Magazines, July 26th Only – Use Coupon Code 15CJ0727 and Save an Additional 15%! Martha Stewart Living Magazine Just $14.99 for 1 Year at Best Deal Magazines, July 27th Only – Use Coupon Code 15CJ0727 and Save an Additional 15%! Take An Additional 15% Off at Best Deal Magazines. Enter Coupon Code 15CJ0727 During Checkout. Offer expires July 27, 2014. Take an Extra $5 off $30 at Best Deal Magazines. Enter Coupon Code SAVE5CJ0727 During Checkout. Offer expires July 27, 2014. Take an Extra $7.50 off $40 at Best Deal Magazines. Enter Coupon Code SAVE750CJ0727 During Checkout. Offer expires July 27, 2014. Take an Extra $10 off $50 at Best Deal Magazines. Enter Coupon Code SAVE10CJ0727 During Checkout. Offer expires July 27, 2014. Take an Extra $15 off $70 at Best Deal Magazines. Enter Coupon Code SAVE15CJ0727 During Checkout. Offer expires July 27, 2014. Sat, July 19th and Sun, July 20th. 5 magazines for $20! Create your bundle from the most popular magazines at DiscountMags.com! Get Baker’s Sqaure’s Fruitabulous™ Whole Pies on sale for $8.99 Now through Thursday, July 31, 2014. Choose from: Blueberry, Cherry, Country Apple, Peach, Strawberry-Rhubarb, or Triple Berry (plus, No-Sugar-Added Cherry, or No-Sugar-Added Country Apple). Offer valid for carry-out only. 50% off a full lasagna entree on 7/29/14 at Bravo on National Lasagna Day. All day on Monday, July 21, when you buy one Mango Mojo entrée, you’ll get any second entrée for free. Valid at participating locations. Only one offer can be applied per transaction. Discounted entrée not eligible for Qdoba Rewards points. All Coupon Books are $5.99 each + $1 Shipping Only at Entertainment.com! (Valid 7/14/14-7/20/14). Get one for your city and one where you’ll be travelling! Did you ever think about hosting a foreign exchange student? AFS (American Field Service) is looking for host families. We finally decided to make that leap last year and hosted a student from Portugal. It was a great experience. Sure, we had a lot of questions about whether we should and that delayed us into taking the leap, but our fears were quickly quelled as we ended up having a very rewarding experience. There are many students that still have to be placed. So take that next step! For more information on the available students and about the program contact Amy Vavra at 216-202-4916 or AVavra@afsusa.org. Find more about hosting at http://www/afsusa.org/host-family or 1-800-AFS-INFO. Ohio’s largest free music festival will be in Painesville from July 18-20. For more info go to http://www.parkpartyinfo.com. About a year ago someone pinched me and I grew an inch. What does that mean? Well, my birthday is this week. I appreciate the pinch to grow an inch on my birthdays, but with the growing number of years I don’t so much like the spankings I get every year now. With my birthday comes a lot of deals. Since I sign up to get e-mails from lots of businesses I also get birthday deals from them when my birthday comes around. The Our Town and All Around coupon book contains coupons that are good for a free birthday meal. An additional meal doesn’t have to be purchased with some of the coupons. The coupon can be good up to 14 days before or after a birthday. Register for Geoffrey Rewards at Toys R Us for a $3 gift card given for your child’s birthday. The child will be given a balloon and and crown and their birthday will be announced over the speaker. Card buying tip – Buy birthday or other cards ahead of time at the dollar stores or when they are on clearance instead of paying full price or when they are slightly discounted. You’ll always need cards, so get them way ahead of time so that you don’t overpay. Find free or discounted items during your birthday for adults, kids, or pets at http://www.freebirthdaytreats.com and http://www.birthdayfreebies.com. Save 10% sitewide with code 10SALE. Take advantage of this summer discount and save up to $20, before it’s too late! Deal goes through Sunday, July 13th. This code is valid in the US and Canada. 1.Take 10% off your next purchase for almost any deal on LivingSocial.com when you use promo code “10SALE”. 4.Enter code “10SALE” and hit apply. You may only use this code once. *Maximum savings of $20 USD on purchases made in USD Dollars, $20 CAD on purchases made in CAD Dollars. Promo code must be used between July 10, 2014 12:00 a.m. (Eastern Time) and July 13, 2014, 11:59 p.m. (Pacific Time) Promo codes may only be used on new purchases and cannot be applied to previous purchases. Promotion requires a LivingSocial account, and is subject to terms and conditions found at here. Entire amount must be used in one transaction; no partial redemptions; may not be combined with any other offer including the Daily Gem. Promo codes not valid for ticket or Deal purchases required to be completed on a third party site. LivingSocial reserves the right to cancel the promotion at any time. This offer is single-use and non-transferrable. If you return your purchase, you will be refunded the amount paid. Offer good while supplies last. Void where prohibited. Valid in the US and Canada only. Lake Erie Crushers game in Avon for $5 – save $4! Up to 50% OFF Top All-Inclusive Resorts in Cancun, Mexico. Book now through 7/31/14 and travel through 9/15/14. Up to 60% OFF Oceanfront Hotels in Myrtle Beach, South Carolina. Book now through 7/31/14 and travel through 9/15/14. Up to 50% OFF Hawaiian Beach Resorts in Maui, Hawaii. Book now through 7/31/14 and travel through 9/30/14. Save up to 55% OFF Luxurious Atlantis Resorts in the Bahamas. Book now through 7/31/14. 40% OFF the Blue Diamond in Riviera Maya, Mexico. Book now through 7/13/14 and travel through 12/23/14. 30% OFF All-Inclusive Divi Aruba in Oranjestad, Aruba. Book now through 8/31/14 and travel through 12/19/14. 60% OFF Sandals Emerald Bay Resort in Great Exuma, Bahamas. Book now through 7/11/14 and travel through 12/26/14. 45% OFF Daytona Beach Oceanside Inn. Book now through 7/13/14 and stay through 12/30/14. Save up to 50% Off + Free Extras in Pacific Mexico. Book now through 7/31/14 and travel through 9/15/14. Save up to 50% Off French Quarter Hotels + Free Drinks, Tours, Jazz Brunches & More. Book now through 7/31/14 and travel through 9/15/14. Save up to 70% Off + $200 Instant Credit & $300 in Extras when traveling to the U.S Virgin Islands. Book now through 7/31/14 and travel through 9/30/14. Save up to 50% off+ Instant flight credits up to $150 in Oahu, Hawaii! Book now through 7/31/14 and travel through 9/30/14. Save up to 50% Off + Disney Park Hopper Ticket Deals & Free Days at Universal. Book now through 7/31/14 and travel through 9/15/14. 50% OFF the all inclusive Dream Sands Cancun Resort and Spa. Book now through 7/11/14 and travel 9/1/14 – 10/31/14. All books are $10 each for 1 book, $8 each for 2 books, $6 each for 3 or more books with free standard shipping. Offer expires 7/14/14. Offer is valid while supplies last. Click here for a 20% off Friends and Family day coupon good on Sunday, July 13th: http://www.biglots.com/page/coupon-20140712-master? 70% off + 20% off Summer Clearance! While supplies last. FLASH SALE – Monday, July 14, 11 AM – 5 PM EDT at OfficeMax.com. While supplies last, online only. 30% off regular-priced sale + 20% off savings with code SAVINGS through July 16th. Free Shipping on ALL Equipment Within the Continental USA at SallyBeauty! Up to 40% Off Ellipticals! Up to 40% Off Patio Sets! Up to 40% Off Cooktops! Save 40% (Reg. Price $19.99) On Coleman 15 ” Wide Folding Stool! Save 50% (Reg. Price $19.99) On Fine Tool 3-pk. Camping Lantern! Save 43% (Reg. Price $349.99) On thermos 4-Burner Gas Grill with Side Burner! Save 32% (Reg. Price $499.99) On Char-Broil 6-Burner Gas Grill! Save 30% (Reg. Price $499.99) On Char-Broil 3-Burner Tru-Infrared Grill with Side Burner! Save 38% (Reg. Price $159.99) On Char-Broil 2 Burner Gas Grill! Save 42% (Reg. Price $34.99) On Pendleton Folding Chair! IN-STORE ONLY Tuesday 7/15: Get One FREE Piece of Apparel! Home Grown Cucumbers 4 for $ 1.00! Save 25¢ when you buy any ONE (1) 8CT. package of Ball Park® Franks. Save 25¢ when you buy any ONE (1) Gulden’s® Mustard. Save 25¢ when you buy ONE (1) package of 18 oz SOLO® SQUARED® Plastic Cups (20, 30 or 50CT. only). Save $1.00 when you buy any TWO (2) individual cans of Starbucks Refreshers® beverages. Save $1.00 when you buy any TWO (2) Wasa Crispbread Crackers. Get 3 issues of All You for only $5 plus get a FREE Coupon Book. Every All You subscription between now and July 31st will be accompanied by a FREE coupon book with hundreds of dollars in savings – get this great offer while it lasts! This coupon book includes savings to top retailers including The GAP, Best Buy, Sears, and many more great stores. Take advantage of this great limited time offer now! Coupons, savings tips, and a FREE coupon book, what could be better? Find great money saving coupons, spring cleaning tips & shortcuts, family menus & recipes, free samples, and a whole lot more! Take an Additional Additional 20% Off ShopSmart Magazine Magazine – Enter coupon WKLYSPEC During Checkout – Just $15.96 for 6 Issues or $25.56 for 1 Year! Take an Additional Additional 20% Off Consumer Reports Magazine Magazine – Enter coupon WKLYSPEC During Checkout – Just $19.16 for 1 Year! Outdoor Photographer Magazine Just $3.29 for 1 Year at Best Deal Magazines, July 14th Only – Use Coupon Code 15CJ0720 and Save an Additional 15%! Cat Fancy Magazine Just $7.49 for 1 Year at Best Deal Magazines, July 15th Only – Use Coupon Code 15CJ0720 and Save an Additional 15%! Eating Well Magazine Just $7.49 for 1 Year at Best Deal Magazines, July 16th Only – Use Coupon Code 15CJ0720 and Save an Additional 15%! Girl’s Life Magazine Just $6.49 for 1 Year at Best Deal Magazines, July 17th Only – Use Coupon Code 15CJ0720 and Save an Additional 15%! Digital Photo Magazine Just $4.99 for 1 Year at Best Deal Magazines, July 18th Only – Use Coupon Code 15CJ0720 and Save an Additional 15%! Cesar’s Way Magazine Just $6.99 for 1 Year at Best Deal Magazines, July 19th Only – Use Coupon Code 15CJ0720 and Save an Additional 15%! Kiwi Magazine Just $3.99 for 1 Year at Best Deal Magazines, July 20th Only – Use Coupon Code 15CJ0720 and Save an Additional 15%! Take An Additional 15% Off at Best Deal Magazines. Enter Coupon Code 15CJ0720 During Checkout. Offer expires July 20, 2014. 250+ Magazines under $10 with this coupon! 60+ Popular Magazines – Just $3.99 with this coupon! 30+ Popular Magazines – Just $5.24 with this coupon! Take an Extra $5 off $30 at Best Deal Magazines. Enter Coupon Code SAVE5CJ0720 During Checkout. Offer expires July 20, 2014. Take an Extra $7.50 off $40 at Best Deal Magazines. Enter Coupon Code SAVE750CJ0720 During Checkout. Offer expires July 20, 2014. Take an Extra $10 off $50 at Best Deal Magazines. Enter Coupon Code SAVE10CJ0720 During Checkout. Offer expires July 20, 2014. Take an Extra $15 off $70 at Best Deal Magazines. Enter Coupon Code SAVE15CJ0720 During Checkout. Offer expires July 20, 2014. New with TGIFridays. Buy one appetizer at $10 each (per person) and get free refills on same appetizer. Valid on select items only. At participating US restaurants for a limited time. Dine-in only. One offer per person, per visit. Not valid in conjunction with any other coupon, promotion or discount. While supplies last. Tax and gratuity not included. Now let’s get Cleveland that much anticipated Championship!!!! C’mon Cavs. Gotta make it happen!! Get $25 Restaurant.com gift certificates for $6! Regularly $10 for a $25 gift certificate, it’s on sale for 40% off for $6! Use promo code: DEAL at checkout – Code good Friday, July 11th. Get them now before they sell out! No expiration date on the certificate! Find Thousands of restaurants with the discount across the U.S.
Get $25 Restaurant.com gift certificates for $5! Regularly $10 for a $25 gift certificate, it’s on sale for 50% off for $5! Use promo code: TRENDY at checkout – Code good Thursday, July 8h. Get them now before they sell out! No expiration date on the certificate! Find Thousands of restaurants with the discount across the U.S.
Drugstore deals start Sunday, July 6th. Check out a segment I filmed with Jonathan Walsh about deals for your July 4th weekend picnic. Prices so low that you won’t mind if the ants eat it too! Click here to view the segment: http://www.newsnet5.com/money/consumer/consumer-specialist/were-saving-you-money-for-the-4th-of-july . THIS WEEKEND ONLY July 3rd- July 7th, users can communicate with their matches absolutely FREE! This promotion is US only! In honor of the Fourth of July 39DollarGlasses.com is giving you $20 off every pair of glasses! Use code USA20. Valid June 30 – July 7, 2014. Beat the heat with a new pair of prescription eyewear from 39DollarGlasses.com and save $15 off every pair! Valid July 1 – July 31, 2014. Use code EAGLE15. Are your tires as bald as Yul Brynner? If so, time to check out Tire Rack for some great tire deals? • BFGoodrich, Get Up to a $70 Reward Card! When you purchase a set of four (4) select new BFGoodrich® brand passenger or light truck tires you may be eligible to receive up to $70 via MasterCard Reward Card after submission. Offer valid on tires purchased from Tire Rack’s in-stock inventory now through July 12, 2014. • Eibach, Get a 10% Rebate! Purchase a select Pro-Kit Spring Set, Sportline Spring Set or Anti-Roll Kit and you may be eligible to receive a 10% Summer Rebate. Offer valid on select Eibach products purchased from in-stock inventory between July 1, 2014 and August 31, 2014. • General, Get a $50 Prepaid Card! When you purchase a set of four (4) select General passenger or light truck tires you may be eligible to receive a free pair of SMS Audio “Street by 50” headphones or a $50 Prepaid Visa Card by mail-in rebate. Offer valid on tires purchased from Tire Rack’s in-stock inventory between July 1, 2014 and July 31, 2014. • Yokohama, Get a $60 Prepaid Card! When you purchase a set of four (4) Yokohama ADVAN brand tires you may be eligible to receive a $60 Tire Rack Prepaid MasterCard by mail-in rebate. Offer valid on tires purchased from Tire Rack’s in-stock inventory between July 1, 2014 and July 12, 2014. Goodyear/Dunlop, Get Up to an $80 Rebate! When you purchase a set of four (4) select Goodyear or Dunlop tires you may be eligible to receive up to an $80 mail-in rebate. Offer valid on tires purchased from Tire Rack’s in-stock inventory now through July 31, 2014. KONI, Save Up to 25%! Select KONI products are now 25% off. Prices shown reflect 25% discount. Offer valid on qualifying KONI products purchased from in-stock inventory now through August 31, 2014. Clearance pricing of up to 60% off on a great selection of wheels makes it the perfect time to update your vehicle or to create a Tire & Wheel Package. Receive 14% off your next purchase with code 14JULY. This offer is valid through July 6th in the US and Canada. 1.Take 14% off your next purchase for almost any deal on LivingSocial when you use promo code “14JULY”. 4.Enter code “14JULY” and hit apply. You may only use this code once. *Maximum savings of $20 USD on purchases made in USD Dollars, $20 CAD on purchases made in CAD Dollars. Promo code must be used between July 1, 2014 12:00 a.m. (Eastern Time) and July 6, 2014, 11:59 p.m. (Pacific Time) Promo codes may only be used on new purchases and cannot be applied to previous purchases. Promotion requires a LivingSocial account, and is subject to terms and conditions found at here. Entire amount must be used in one transaction; no partial redemptions; may not be combined with any other offer. Promo codes not valid for ticket or Deal purchases required to be completed on a third party site. LivingSocial reserves the right to cancel the promotion at any time. This offer is single-use and non-transferrable. If you return your purchase, you will be refunded the amount paid. Offer good while supplies last. Void where prohibited. Valid in the US and Canada only. On June 26th, 1974, Marsh supermarket implemented the first ever barcode scanner by scanning a pack of Wrigley’s Juicy Fruit gum (that might be good to know if it shows up as your Final Jeopardy question). It was the first time a supermarket anywhere scanned a product with a barcode. 20% OFF promotion on our AncestryDNA test, July 2-6 only. Volume Discount Sale! 1 book for $10, 2 books for $8 each, 3 books for $6 each + Free Shipping Only at Entertainment.com! (Valid 7/1/14-7/6/14). Get the extras for any city you’ll be traveling to this summer! Take $50 off orders over $100 for the first 1000 customers, $40 off $100 for next 1000 customers, and 30% off nearly everything for next 2000 customers with code WD27 at AdvanceAutoParts! 70% off Spring & Floral Inspiration Floral, Containers, & Pottery, Entertaining, Gardening, Holiday Inspirations Patriotic Decor and more. 7/3: Extra 20% off School Uniforms at Justice & Brothers – One Day Only! 7/7: Extra 30% off Clearance at Justice & Brothers – Buy 4+ Clearance Items, Get Free Shipping! One Day Only! 7/8: Extra 20% off School Backpacks & Supplies at Justice & Brothers – One Day Only! 7/9: Extra 40% off Clearance at Justice & Brothers – Save Up to 85%! One Day Only! Starts 7/3: In-Store & Online, Everything On Sale at Old Navy! Up to 50% Off the Entire Store. Ends 7/6. Restrictions apply. Click here for a $5 off $30 purchase coupon good though 7/6 at Pet Supplies Plus:http://www.petsuppliesplus.com/coupon.jsp? Save 20% on any single purchase of loose Bananas at participating retailers. See offer info for complete details. Check back every Tuesday for a new Healthy Offer. Get a 1 year subscription for just $12 or a 2 year subscription for $15, that’s only $0.63 an issue. This is the best multi-year offer we have ever had, take advantage of this great offer now! Hurry, offer ends 7/31. Shop now and take an additional 18% off our already low prices with coupon code JULY4SAVE. Sat, July 5th and Sun, July 6th. It’s the $5 Sale! Subscribe to the most popular magazines at DiscountMags.com for only $5/year! On July 8th from 7 am to 7 pm get a short stack of pancakes for 56 cents at IHOP to celebrate their 56th Anniversary. Check out a segment I filmed with Jonathan Walsh about deals for your July 4th weekend picnic. Check out my Facebook page for additional deals. Click here for the story or click on the banner above: http://www.newsnet5.com/money/consumer/consumer-specialist/were-saving-you-money-for-the-4th-of-july . You are currently browsing the JoeTheCouponGuy.com Deals Blog blog archives for July, 2014.